All of the following Rocky Mountain National Park GPS waypoints and routes have been obtained by using a Magellan GPS while hiking around the park. All waypoints are in WGS84 datum and should only be used for recreational purposes and NOT for primary navigation. Always carry a map and a compass with you for primary navigation. The name of each waypoint is 6 characters (the limitation of the GPS unit used). 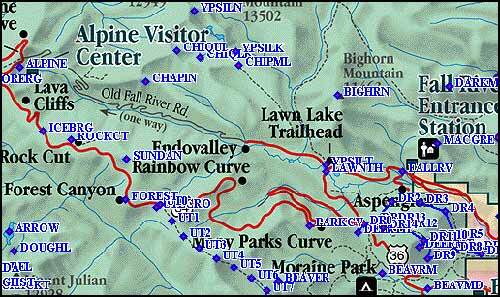 The download file is named rockymtngps.zip. This zip file contains a text file named rockymtn.txt. Please read the instructions for your gps software on how to reformat and import the generic text file. A spreadsheet program can be used to reformat the text file, if necessary, for your current gps. Please click "I Agree" if you agree to the terms of this agreement and would like to download the Rocky Mountain National Park GPS waypoint file. If you are planning to visit Estes Park & Rocky Mountain National Park... and you want to maximize your vacation and hiking experience, preview the fast... action packed Rocky Mountain National Park Videos and select the hikes that fit your hiking abilities. Then take a video tour of Estes Park to see the special shopping promotions, restaurants, outdoor activities, entertainment, special events and much more. It's always best if you can plan ahead! Take A Tour Of Estes Park & Rocky Mountain National Park.